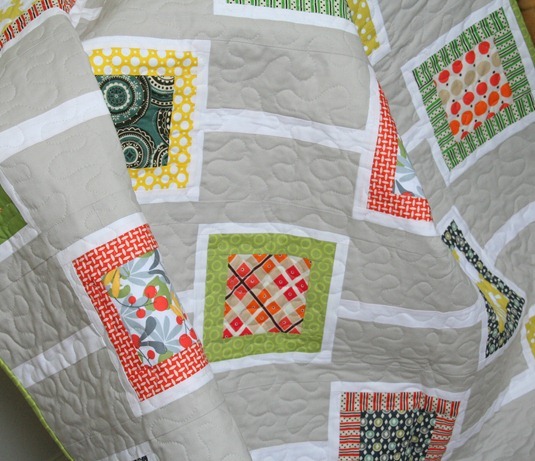 I never properly showed you this quilt…its a grey version of the Chain Reaction pattern. The grey is Kona Ash I believe, and its backed with Kona Aqua. 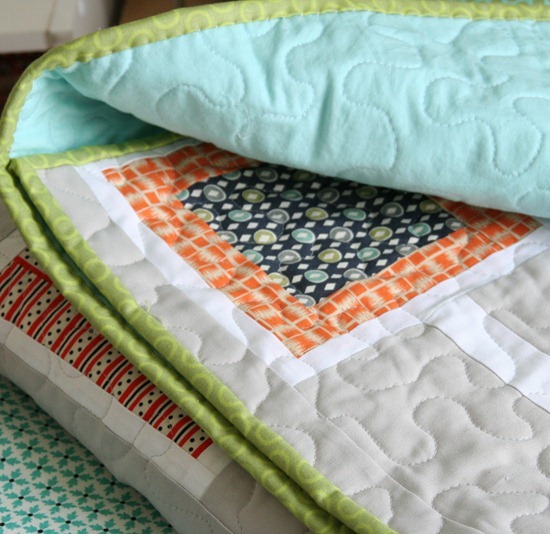 I love the light grey for a boy…although I think I still love the aqua version of this quilt better. Oh I love that one! Grey is one of my favorite colors. I really like the grey with the white. That is gorgeous! I love the gray. Lovely! I love Kona Ash, I use it often in my quilts. I think it is the perfect sashing for the bright colors you use. Gorgeous – Ash is one of my favs. The quilt is stunning! I love the grey/white with the bright colors of the blocks. It's a wonderful quilt! Beautiful! I love the way the colors pop off of the grey and white background. your binding choice is lovely as well! Still can't really see it. Please send it to me and I will see it better. Hee Hee Mar… it too me a second to get it. :) I'm so slow. looks beautiful! i'm loving grey this season! I love the grey but I am a sucker for aqua. I love both quilts! I loved the grey quilt! The neutral background really makes those colors pop. It's gorgeous!! Lovely! The coloring on this quilt is beautiful. That is such an awesome quilt! I featured a project of yours and your blog on my weekly post today! I hope you'll stop by! I love the grey with the white. Beautiful! Great color combos that I would never think to put together! Love the Grey it is Perfect. Your blog is new to me. I really your style. I am not drawn to gray so I don't use it much but when I see it with other colors I always love it. It makes me want to do some experimenting. Great quilt! The grey really makes the colors "pop"! what a beautiful pattern to showcase and feature some awesome fabrics! I love it. Thanks for sharing that the gray/ash is from Kona. I've so often seen this type of color used and never knew where to even begin to look for some of my own as I do not have a near to me quilt store. Now I know that I can look for it on line. thanks! This is incredibly gorgeous! Clean design, fun colors and amazing fabric choices! And the Kona Ash — stunning! I love this one! I was thinking of buying the pattern, but I was wondering what the fabric requirements are.